10.09.15 It is 10.000 before Christ -give or take a century - and the White Tribe and Black Tribe compete for the available food and resources in the wilderness. Staying alive until the end of the game gives you a serious competitive advantage in this rat race, and that means: gathering enough food for the entire tribe every single day. Every minute spare time is spent on the construction of useful items such as an axe, a mortar, a wheel or drums. These items score points, and 24 points lead to victory! The bigger your tribe, the more objects you can construct. But a big tribe also implies that a lot of food is required to feed all those mouths. 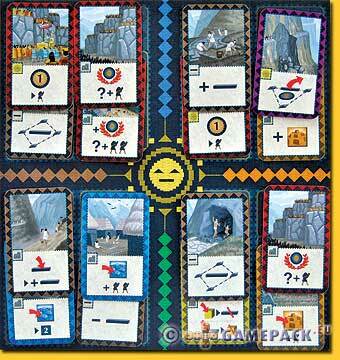 Players start with two tribe members and six character cards. 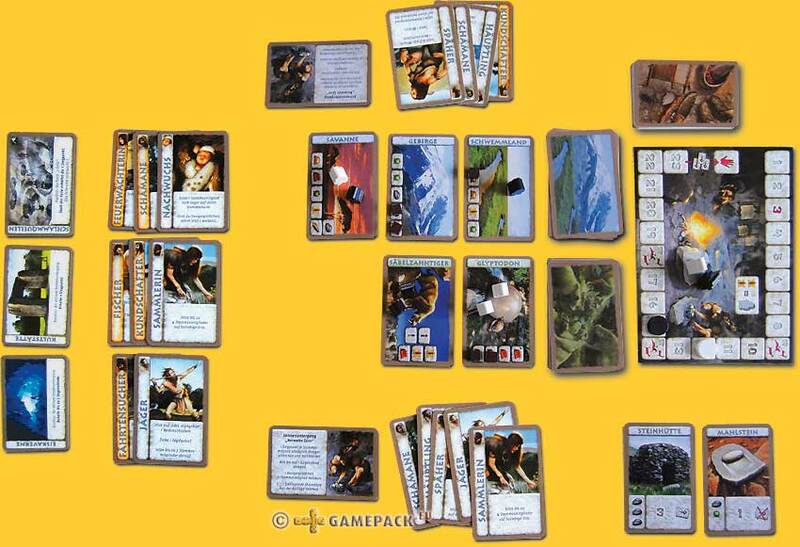 Wilderness cards and hunting ground cards are placed on the table; wilderness cards supply all types of resources, hunting grounds only provide meat and skins. 24.07.11 Welcome to the twilight zone of vampires and werewolves! These creatures do not get on very well together and so they confront each other, under cover that is, under the hex tree, at the grave yard or one of the other four locations. Gradually the suspicions against the characters players play become more certain, and at some time one or more characters will be known to the enemy; their final hour now has struck as they will be hunted down. When all werewolves are eliminated, the vampires win, all of them, even those who got killed before; when all vampires are eliminated, the werewolves win under the same conditions. Not to mention the humans! 'Jäger der Nacht' is a pleasantly short and rather simple family game that gets even more fun and exciting the more players participate. Four to eight can play, with the characters more or less evenly divided, but the game gets more exciting with five players or more when human characters participate. Each player gets a character card that shows who and what he is, when he or the party he belongs to wins, and how much life points he has that are noted on a separate life track; the characters vary in life points. A player moves his token by the roll of two dice. Each location has a special feature that may be used, such as drawing special cards that may have an effect at the health of a specific or random character whose health may in- or decrease. After this a player may attack a character that is within range. Assembled red cards may be used in an attack to aid another character on his way of the life track -downwards. Playing green cards a player gets information about the identity of an other character: is he with me, or does he belong to the other side? This investigation gives the game an initial and additional thrill: who is whose mate? The blue cards mainly trigger positive events that must be executed immediately: 'You have an additional turn' or 'Protected against attacks till the following round'. With four players there are two vampires and two werewolves in the game, but with eight players there are three of each of them, as well as two human characters. Thes humans have their own agenda: they don't care much about the struggle between vampires and werewolves, but win under special conditions such as collecting three specific equipment cards, occupying a specific location at game end, or even being the first to get eliminated. The special features of a character can be used only once in a game and can be pretty violent. A player should apply the effect wisely, as with using this feature he has to reveal his character by placing it face up, so anyone now can see who he is, and how much damage he has to take until he is eliminated. The enclosed almanac contains useful tips for the (first) use of the characters with the various characters and participating players. As there are twenty characters supplied, not all of them are used in a game, so variation is guaranteed and the tension will stay high. Uruf Han, the vampire, just to mention one character, has a nice and peculiar special feature: he may lie in answering a green card question played by an other player, and he does not have to reveal his character after using this feature! 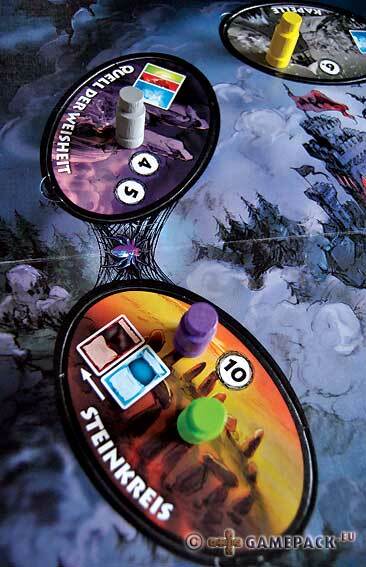 At first glance 'Jäger der Nacht' looks like a regular party game and it can very well be played as such. But it also offers finesse and sophistication, making it -or just- for the experienced player a fun and exciting challenge! 16.05.11 Three or four leaders try to add as many regions to the Inca Empire as possible and perk it up with all sorts of structure, which will earn them status locally but points in the game. Each turn a player may build up to two roads, providing it is connected to his already existing network of roads. When this network is connected to sites where a player can and wants to build a terrace, garrison, city or temple, he pays for it with workers. 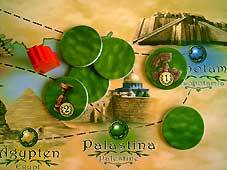 Each construction immediately scores victory points, from one point for a terrace to four points for a city or temple. More than the initial workers provided at the start of the game can be acquired by using workers to conquer a region. The markers from a conquered region provide both points (but this only once) as well as workers (each round) that are distributed at the start of each of the seven rounds. Each new round workers are distributed apart from ones supplied by the conquered regions, but this base amount decreases rapidly by each new round. Therefore it is necessary a player will have to take care he has sufficient workers for all the construction he wants to perform. Each round is concluded by assigning victory points for terraces, garrisons, cities and temples that are connected to a players network of roads. The built construction does not necessarily had to be built by that player himself! Players who like to hoard must be disappointed to find that at the end of each round only a certain number of workers may be taken into the new round. The length of each round varies: the first explatory round only has the distribution of workers and two construction turns, but from the second round they increase in length and already are twice as long with two sun phases where the player order is determined as well as the playing of event cards. On a seperate board players one by one, in player order, place a blind event card from their hand. The 'fence' states which two players this card applies to. When all players have played a card, the cards are turned face up that are in effect for the current round. This can be to a players advantage, such as the additional placing of a road, but it also can turn out to be unfavorable: in case of the card 'harsh weather' the effected players have to pay an additional worker when building a garrison. Of course players will place favorable cards next to themselves, but this advantage then also applies to one of his neighbours. Which one to favor? In a following sun phase in the same round additional cards are placed that get active, but also the old ones stay in effect! This way at the end of the last sun phase in the last round four event cards for each player are in effect that he all has to take into account. All effects are cumulative but this also means they can neutralize each other. It is a pity that especially because of the event card 'wilderness road' each player has managed to get connected to each of the constructions of other players; there is not really a possibility to keep a construction for oneself and be the only one to score for it. The differences in points at the end of the game therefore are marginal, and this is a bit unsatisfying for the effort and time. A full game takes too long and the shorter variant is strongly recommended, but then still such a game takes its time. And only if it was exciting in some way, but nothing really shocking happens; each player does his own thing and tries to optimize with the resources he has. 'Inca Empire' has a nice concept but it could have had a shorter span; it is mainly due to the time length that doubt arises. When the proposal would be playing 'Inca Empire' or two other comparible games in the same time, the choice certainly will not be in favor for this game. It is an OK game to play occasionally, but it's not for each players taste. Try before you buy! 16.10.10 It's not easy to be original, and in this way a comparison between 'Jerusalem' and 'El Grande' is easily made. 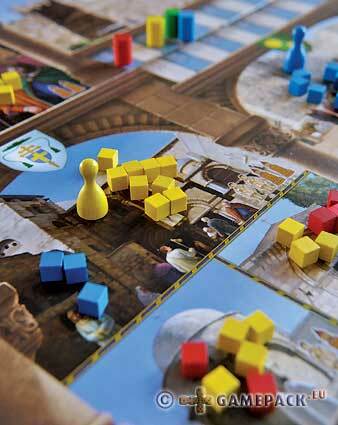 In the various quarters of the city of Jerusalem cubes are placed, and in the income phase the player who has a majority in a quarter takes the reward: cubes, money or prestige points. These points are important as with them tower floors are bought, and after five rounds the player has won who has built the highest tower. 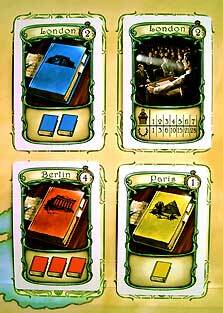 'Jerusalem' is further dressed with role cards at which at the beginning of a round is bid; the player with the lowest numbered role card may start the round and takes seven tokens from his supply; the fourth and last player gets only four. At the same time action cards are dealt with which Nice Things can be done. Each player has a special token with which he is able to block a quarter for a full round so no other player can place any more tokens there; this way important quarters can be taken with only a minor majority. The Tower of David is a separate quarter and is scored first. The player with a majority here may move one of his tokens from the tower to any other unblocked quarter; useful to gain a possible majority after all players have placed their tokens. After scoring players have to exchange all their privilege point into tower floors. The cost is one per level of tower floor, plus one. A player who is the first to built a floor must pay one additional prestige point, so when he is the first to build a third floor he must pay five prestige points. At the end of some rounds an event card is turned face up. They denounce a quarter where all tokens must be removed, sometimes reduced when payed for with money, or because of the presence of the special token. 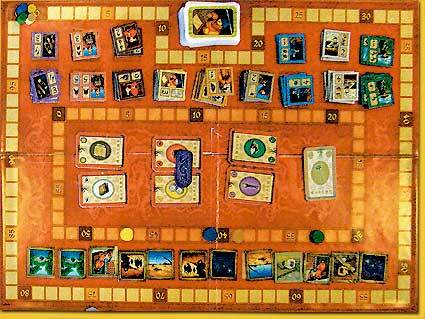 All smells and feels 'El Grande', but lacks its sophistication. The quarters can easily be seen as the provinces, the Tower of David feels as the castle, and the special token acts a bit like the king in 'El Grande'. But because players can place their tokens unrestricted and not hindered by the presence of the king, especially the first player has a hard time. A helpless feeling comes over him as each discrete placement of tokens and gained majority in more than one quarter can be nullified by any player after him. So it soon turns into a severe scolding and he places almost all of his tokens in just one quarter. The last player, equipped with less tokens, of course cannot beat this but the author must have thought otherwise: that he could pick any quarter and make the difference gaining the majority with only a few tokens. 07.03.08 It is commonly known that pirates have their base in Jamaica, and, being the unrestrained bunch that they are, they love senseless relaxations. At the time we arrive, they are about to organise a boat race around the island; the contestants may rob each other from their possessions but they are also able to dig up bonuses that are hidden along the course. Well, count us in; we put our ships at the starting line that also acts as the finish after the island has been rounded. Each player gets a card board that represents the cargo holds where he can store his gold, food or gun powder. The active player begins his turn with throwing two dice and decides which goes with the morning action, and which with the evening action. All players have their own set of player cards; at game start they have drawn three from this blind stack. 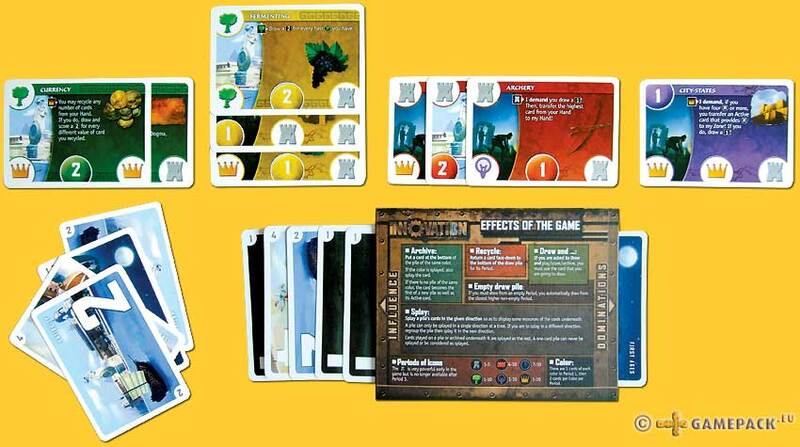 From these all simultaniously choose a card, but the active player opens his card first and performs the actions on it. The left symbol is for the morning action, the right symbol for the evening action: moving forward, moving backwards, or taking food, gold or gun powder, as much as the throw of the die for this action. Players do not know what others have chosen; will green be moving and go for the treasure? Or will I play the card that gives me a lot of gold, as the 'evening die' is a '6'? 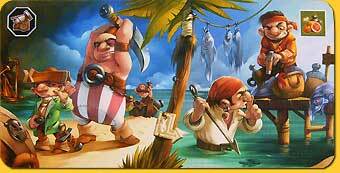 At the treasure locations a blind treasure card may be drawn; these give plus or minus points but also extras such as an extra cargo hold, or two additional points on the die in a sea battle. When a player ends his move with an other ship, a battle is fought and the attacker throws a special battle die. First he could have added gun powder chits wirth each chit counting as an extra point on the die. Doing this makes sense, as the battle die has values ranging from 2 to 10, so the outcome can be very fickle! Luckily the die also shows a star which instanly settles the fight in favour of the thrower. He gets rewarded and may take the contents of one hold of the defeated opponent which goes to an empty hold of his own. If he has no empty hold, he must empty one, but not containing the same kind he just has taken from his opponent. Treasure cards also may be robbed. Food is necessary at most spaces, at some places the crew unexplicably has a greater taste than elsewhere! And the little harbours demand solid transit duties in gold, so gold too is needed to complete the race. When a player lands on a space that he cannot pay the duties for (gold or food), he has to go backwards, one space at a time, until he can pay, or until he lands on a free space (and eventually take the treasure there). Meanwhile possible sea battles also have to be fought. When the first pirate has reached the finish line the game ends, and all players count their gold and the (minus) points from their treasure cards. 'Jamaica' is a very nice and easy accessible family game that also will be to the heart's content of the seasoned player. The atmosphere is good, and the beautiful cartooneque drawn cards in line with the French style of strip drawing contribute to this. The lower limit of thirty minutes playing time is unrealistic; a game takes just over an hour. Either way, short or somewhat longer, with 'Jamaica' you will have a good time! 01.09.07 It is the Year of the Dragon, therefore the game lasts twelve months. During these twelve rounds you try to score as many points as possible, by building palaces, pleasing the gods and at the same time try to cope with the calamities in this year of the dragon. 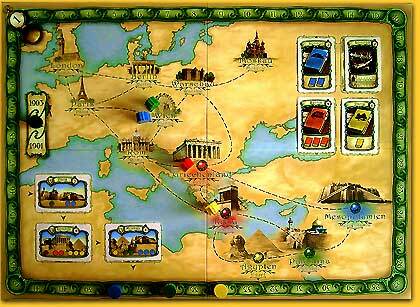 The gameboard consists of two score tracks, one for the victory points and the other one to keep track of priority. The priority track determines the order in which the players take turns. Also there is space for the workers whom a player can engage in its palaces and a space to put the action-tiles. The events for each month are laid face up. Each player gets two palaces consisting of two levels and some money. A player also gets a set of cards, on which the workers are depicted (one for each type of worker) and two cards with a question sign that act as wild cards. Each round consists of four phases: an action phase, an employ worker phase, an event phase and a scoring phase. In the action phase the players, in order of priority track, choose an action. There are seven actions to choose from: • Collect taxes: you receive two coins plus the amount of coins as represented on the tax-collectors in your palaces. • Books action: you gain one point plus points equal to the books the wise men in your palaces carry with them. • Harvest rice: you receive one rice plus one rise for the number of farmers which are in your palaces. • Produce fireworks: you receive one fire arrow plus one fire arrow for each fireworks maker who is employed in your palaces. • Samurai: increase your influence on priority track equal to the number of samurai that in your palaces. • Privilege: buy a privileges which scores points at the end of each round. • Build: construct palace parts equal to the number of construction workers which are in your palaces. Furthermore a player also can choose not to take an action and refill their money up to three coins. When an action already has been chosen the other players still may choose the action, but have to pay three money. 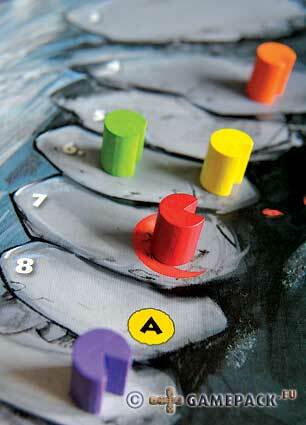 Each turn action tiles are placed on the board. Depending on the number of players some are laid down as a pair. If a player chooses a pair, he can only perform one action but both actions are considered as used. In the worker stage, each player plays a card from his hand and adds the concerning worker to a palace. The card is discarded. Because each card is only represented once beside the two wild cards who can be used for any worker, there is a limit on the number of each worker a player can employ. Beside the aforementioned workers, a player can engage medicine-men to protect his workers from epidemics. He can also employ a geisha, who at the end of each turn scores a victory point, and Mongols who raise the value of palaces at the end of the game. Several workers come in an experienced variety, these experienced workers have more powerful properties, i.e. experienced farmers produce more rice during the harvest action. Each worker also has a number on his card by which a players score on the priority track increases. When he employs this worker, experienced workers have less influence on the priority track. The number of workers a player can accommodate is limited by the space in his palaces: 1 person per palace level, with a maximum of three levels per palace. The number of palaces however is unlimited. In stage three the event takes place. There are six types events, which each take place two times. In the rest event nothing happens. In the emperor event the kings collects taxes, and each player must pay four coins, if he cannot pay the four coins he has to sacrifice one person for each coin he cannot pay. This also goes for famine, where each player must pay rice equal to the palaces he owns. If he does not have enough rice, he must sacrifice one person for each rice he does not have. During the epidemic three workers die, but for each medicine man a player has in his palaces one worker is saved. During the fireworks display the player with most fire arrows gets 6 points, with the second place getting three points. In the samurai event, each player gets points for his samurai. The player with the lowest samurai number must sacrifice one worker. Should palaces become uninhabited by the loss of workers one level erodes of that palace. Finally at the end of each round, players score points. Each palace scores one point, as do the geisha's and the bought privileges. At the end of the year there is a final scoring round, with each person that survived worth two points, and each palace worth one point per level for each Mongol which is employed in that palace. Each set of three coins also is worth one point. Needless to say, the player with the most victory points wins the game. 19.04.07 If there are treasures to excavate, we are first in line! Ofcourse this is done for honour and glory only - we are no grave robbers, or closer at home, art-dealers looking as if butter wouldn't melt in their mouths. Some infamous inheritors additionally throw in their ethnical past persecuted background into the unethical battle, but ultimately it all is about money, and not about rights or rehabilitation. Besides: if everything in the world went fair, the pyramids never would have been built if it were not for the slaves that carried the bricks, or at the cost of devoutly souls the most splendid cathedrals would not have been erected, or, more contemporary and on our own farmyard, we could not enjoy our daily cup of coffee that cheap! So, it serves them right! Well, the levelling and lazyness encouraging socialism does not work, the unscrupulous capitalism has its transgressing downside too - shall we try the sharia for a change then? Fame, it is a nice concept, but ultimately we want to convert it into cash or get better from it! This is possible after we have done between two and three years of research and excavating in the game; the collected items are then transferred into points. On a map of Europe we start in Warsaw, and move from there to various other European cities to make our knowledge of old cultures more profound. This takes time, each move to a city takes a certain amount of weeks, as does the reading of the books in the libraries. How much time the study takes is stated on each book card. The book card, or other helpful resources, is put in front of us, and this leads to growing information on Greece or Mesopotamia, for instance. When satisfied with enough information, we travel to the site and put our shovel into the ground. On an 'excavation disc' we rotate the window towards the amount of knowledge; after that we decide how many weeks we would like to stay at the site to excavate. Cross indexing this gives a number of times that we may try our luck in a cloth bag of the site, where the treasures of the site are hidden under the sand. The more knowledge we have collected in advance, the less time it takes to grabble a greater amount of times in the bag. The player who is researching or does an excavation advances his marker on the calender and takes his turn again when he takes the last position on it. This way it could happen that a player takes his turn more than once after another, or, the opposite, that he leads and has to wait several turns until the others catched up with him and he is the last on the calender again. It seems as if it matters much: the collecting of knowledge through collecting books, to consequently start excavating. But this tactical element is blown away completely by the totally random disc grabbing from the bags. 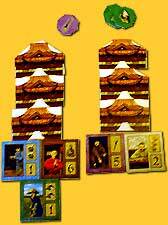 One player may have luck and draws three out of five treasures, while another player just before him, with the same amount of draws, draws five sand discs. This all seems very hilarious at first, but gets very coincidental and frustrating in the end. Because of this, the game falls apart into two styles: in the first part of the game there is a tactical element of where to go and what to collect regarding knowledge, and for what site a player would like to emphasize his knowledge; whilst in the second part, the excavation, the game deteriorates into a lottery where in fact it does not matter that much how much knowledge a player has collected. These two parts: tactics versus lottery, do not match together. 06.03.07 In Imperial, we all take the role of a country and try to earn money, right? Well, this is only partly true. We rule one or more countries in order to make the most money with them, but we should not hang too emotionally on England, France, Germany, or one of the other four countries in the pre-Great War era. If they perform bad, we try to invest in other countries. We act more as unscrupulous investors than as leaders of a nation. In this regard we do not differ from contemporaneous companies such as Google, McDonald's or other large industries that invest in China; they are not for nothing very aptly named multinationals. As it’s not the government that rules a country, it’s the money - and it seeks the largest profit for investment, human rights or not! At the start of the game, which player will take which country is randomly determined and the ‘owner’ pays the necessary money for it to take interest in it in the form of bonds. This entitles him to act for this country, taking decisions such as raise taxes, build factories or armies, move armies, and so on, but only as long as he is the greatest investor for this country. As soon as another player takes a greater interest in bonds, that player takes over the country and decides which action to take for it. Players get income by raising taxes: for every neutral territory (land and sea) and each unoccupied factory they collect income. The country itself increases its power points on a track that shows if the countries marker on the score track is advanced; if a countries marker on this score track reaches ‘25’ the game ends and all bonds are converted to money. Countries that have advanced further on this track may multiply the revenue for their bonds up to 5 times, so it is obvious that players will keep an eye on this track when they buy additional bonds. When it is a country’s turn, the player decides which action to take from a circle divided into action segments. The country’s marker may be freely moved up to three spaces, each of them depicting a different action, and this is why the game makes so much fun; players are more or less unrestricted in picking their action. Going to war is not very wise in this game, as other players will benefit from it by growing ‘their’ country, in unopposed taken territory, raising taxes, and taking even more bonds in it. 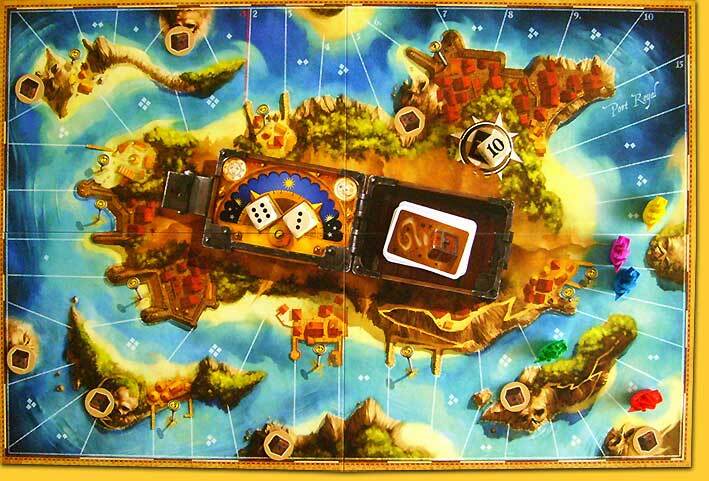 The game comes with plenty wooden pieces, representing factories, fleets and armies, as well as the various markers. At first glance it might appear as a complex game which is not, but one should constantly be aware that it might be better to switch strategy than to hang on to a country’s health or wealth where it is obvious that this is useless. With a gameplay of about two and a half hours however, this is not a short game, so it will still be played by the dedicated gamer. Eggertspiele has in more than one way delivered a great game! 20.10.06 Never satisfied with what you have, that is the flaw of all times and less sympathic people. Hard labour, under biblical transpiring conditions, yes it happens, but only by those at the bottom of the social ladder where status, look and wealth are valued more than the more introvert human virtues as compassion, friendliness and altruism. 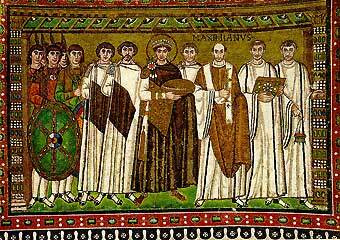 Be it so, it is not our fault that the world is the way it is, so we play ball, this time at the court of emperor Justinian where we try to persuade the people around the emperor that matter to recommend us. Payment is in Never Cashable Imperial Victory Points, so there is no need to treat our temporary business as a major issue. 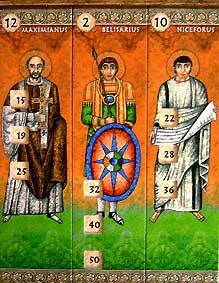 The court of the emperor consists of twelve people, among whom the famous generals Belisarius and the euneuch Narsus who fought their battle against the Ostrogoths; but in fact the ever distrusting Justinian replaced the first with the latter so in fact they never served at the same time. The numbered favorites initially are placed in increasing order but this may and will change during the course of the game, dependant on the played chits by the players who start initially with ten of these, in negative or postive values, to change the order in such a way that it will benefit them most during one of the three scoring phases of the game. Which favorite to manipulate is dependant of a player's hand of eight cards in four colours, each colour ranging from 1 to 12. By changing a favorites position, the score for that card changes as can be read from one of the three tiny windows that each figure has. When the first scoring takes place, the lowest number (upper window) is scored as points if the corresponding card is played. Scoring only takes place if at least one player has collected enough chits (positive or negative) in the scoring pool for that round. After three scoring rounds the game ends. 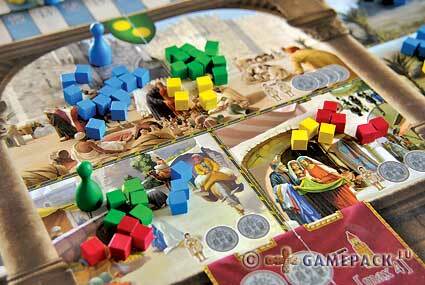 'Justinian' is a beautiful and sturdy executed game that catches the atmosphere of the mosaics very well. The illustrator however failed to interpret the meaning of the classical iconography and transferred it somewhat altoenthousiastic to modern times ('Èveryone is a giant!') by supplying all the worldly favorites with a halo and in doing so upgrading them to an unjust holy status. To be seen however is how long this game will be attractive as candidate for a playing session; it must be feared that it will have lost its appeal within a few plays. This is partly due to the blind guessing of who wants what where to place. So a player puts a chit at a favorite; will he want it to go backwards or forwards? And if I already placed one at that favorite, did he place a negative number, or does he just has a different coloured card (but the same number) with a positive one, trying to score for that colour? Yes, one can get dizzy from these possibilities! This is only fun for a short time, but it swiftly bogs down resulting in ignorant play. 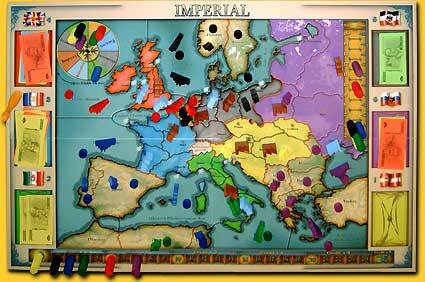 We would like to know where we stand; this game unfortunately keeps us guessing too much.